The SeaBoard was a wooden tugboat that worked Boston harbor her whole life...1921 to 1962. Her principle job was to help move ships in/out but on many occasions also performed fire fighting duty. We salvaged many artifacts from her before she was retired. 1. Solid-brass voice tube. This device was used to communicate from the wheelhouse to the engine room. One blew into it, which sounded a whistle on the other end to alert the crew. 2. 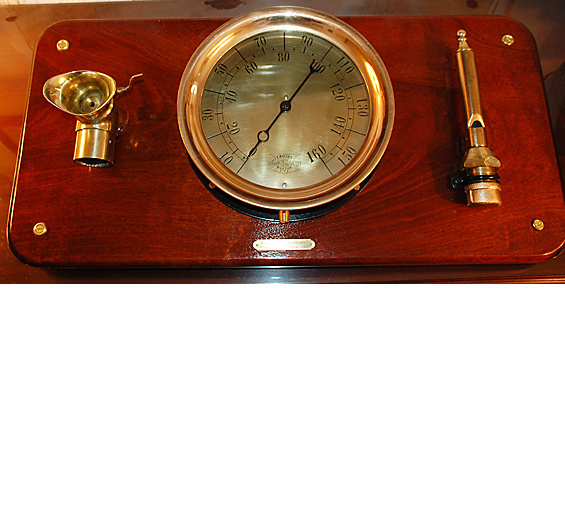 A Large, Crosby Gauge (10 ½” diameter)... 0 - 160 PSI (built in Boston, MA). This gauge manufacturer used this logo from 1886 and 1926. 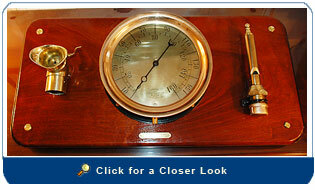 Larger gauges were used in the engine room so they could be observed from a distance. We are not sure exactly what the gauge was used for but it was for either air or water pressure). 3. "Little Toot": this was the small whistle used to communicate with a tow when she was close aboard. She serenaded Boston harbor thousands and thousands of times. All items were restored to near original condition and mounted on a solid mahogany board with four coats of hand-rubbed spar varnish. Size: The plaque measures 28” long, 131/2” high and the board is 1 1/8” thick. Solid brass mounting hardware is included.